Objective: The aim of this study was to evaluate the accuracy of 3 thermosensitive microsensors that record “wear time” of removable oral appliances (OAs). (sensor A, n = 30) and DentiTrac (sensor D, n = 16) microsensors were placed in a water bath to simulate long and short durations of wear. Their accuracy was also assessed when they were embedded in 3 materials: acrylic, polyvinylchloride and thermoactive acrylic. 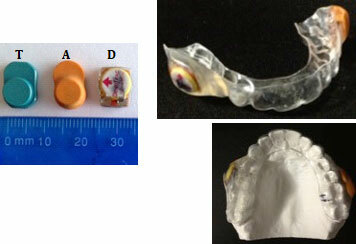 In vivo testing included 14 volunteers, who wore maxillary retainers embedded with sensors A and D for 30 nights. Logs of appliance use were compared with readouts from the sensors. Results: In the in vitro long duration of wear assessment, sensor A, with a mean absolute response difference (MARD) of 1.67 min. (SD 1.41), was significantly more accurate than sensor T (MARD 3.53 min., SD 9.80) and sensor D (MARD 4.48 min., SD 8.46). For short duration of wear, sensor A (MARD 1.41 min., SD 3.60) and sensor T (MARD 1.68 min., SD 7.64) were equal in accuracy and significantly better than sensor D (MARD 14.07 min., SD 10.20). The embedding material had no effect on the recording accuracies of the microsensors. In vivo, there was no significant difference between sensors A and D.
Conclusion: All 3 microsensors are highly accurate and reliable and can be used to record wear time of a removable OAs fabricated from various materials. Successful orthodontic and sleep apnea treatment with removable oral appliances (OAs) is impossible without the cooperation and motivation of patients. Failure to adhere to the prescribed wear schedule may result in little to no response to treatment.1 Although many studies in dentistry and sleep medicine have addressed this issue to determine how to monitor and improve patient compliance,2-14 pinpointing the main determinants of patient adherence is difficult. Investigations of gender, age, psychosocial and socioeconomic variables have found a wide variation among individuals.1,14,15 Evidence also suggests that patients are often selective in which aspect of their treatment they adhere to.16 Thus, predicting which patients will be cooperative is challenging for clinicians. No one variable can be used to predict adherence. Technology plays an integral role in obtaining objective measures of patient adherence. Many investigators have attempted to use monitors to measure use of devices without subjective judgement,2,4-6,14,15,17-41 with Northcutt introducing the first headgear timer in 1974.6 A small microsensor, embedded in the OA, allows for objective measurement of adherence and incorporation of adherence into an overall comparison of treatment modalities. To our knowledge, 3 thermosensitive microsensors that can be integrated into removable OAs are currently being marketed and initial research studies have been published14,31-36,41,42: TheraMon (IFT Handels und Entwicklungsgesellschaft GmbH, Handelsagentur Gschladt, Hargelsberg, Austria), AIR AID SLEEP (AIR AID GmbH & Co. KG, Frankfurt, Germany) and DentiTrac (Braebon Medical Corporation, Kanata, Canada). However, there are no non-industry-supported studies with a large sample size and statistical analysis to evaluate the accuracy of these monitors. A well-designed randomized controlled trial to evaluate the effectiveness of OAs requires established metrics to measure adherence. Thus, it is important to examine the accuracy of the recording capabilities of the microsensors to determine whether they can be used for research and clinical purposes. No clinical simulation benchwork has been done to compare these adherence monitors or nor are there studies to determine whether the various materials used in fabricating appliances influence their accuracy. In addition, no studies have assessed the accuracy of these microsensors in vivo, although recent studies34-36,14, 41,43 have used these microsensors to measure adherence. Thus, the objective of this study was to investigate the accuracy of these microsensors to ensure the validity of their use in objectively measuring adherence to treatment with removable OAs. In vitro testing was carried out on the AIR AID SLEEP (sensor A), TheraMon (sensor T) and DentiTrac (sensor D). Specifications for these microsensors are detailed in Table 1, and their images are presented in Figure 1. Table 1: Characteristics of the sensors available for clinical use. Figure 1: AIR AID SLEEP (A), TheraMon (T) and DentiTrac (D) microsensors and appliance used in phase 2. Our method was based on the research of Schott and Göz,31 who found that a water bath could be used to replicate the oral environment to test thermosensitive microsensors. Two thermostatic water baths (Digital Water Bath, Whip Mix, Farmington, Kentucky), filled with approximately 1 L of water, were programmed to remain at 35°C. The water baths were preheated for at least 1 h to the desired temperature before inserting the microsensors to ensure that the water was at the desired stable temperature. A log sheet was kept to record when the microsensors were placed in and removed from the water bath. No effort was made to keep the microsensors in the same location or orientation in the water bath throughout the trials. The long-duration interval trial consisted of maintaining a number of microsensors (sensor T, n = 20; sensor A, n = 30; sensor D, n = 16) in the water bath continuously for 7 h/day for 30 days. This trial aimed to simulate a patient wearing an OA continuously while sleeping. In a short-duration interval trial, microsensors (sensor T, n = 20; sensor A, n = 30; sensor D, n = 16) were placed in the water bath for 2 h, removed for 1 h and replaced for an additional 2 h each day for 30 days. Thus, the sensors were in water for 4 h and out of water for 20 h each day. This simulates a common daytime wear pattern, in which patients typically wear their appliance and remove it during meals. In a third trial, sensor T (n = 9), sensor A (n = 9) and sensor D (n = 9) were embedded in 3 different materials, acrylic, polyvinylchloride (PVC) (0.035” thick) and thermoactive acrylic, with 3 of each sensor in each material. Blocks of standard thickness were made by an orthodontic laboratory technician (Space Maintainers Laboratories, Vancouver, British Columbia). The blocks with the embedded sensors were placed in the water bath for a continuous period of 7 h/day for 30 days. The blocks were kept out of the water bath for 17 h each day. Ethics approval for in vivo testing of the microsensors was granted by the Clinical Research Ethics Board at the University of British Columbia (H12-00855), and all participants signed a consent form. In phase 1, raw temperature data were exported from the software of the 3 microsensors. For sensors A and T, manufacturers designated temperatures in the range 31.5–38.5°C as representing “wear time”; for sensor D, this range was 33.5–39.2°C. To calculate wear time for each microsensor, the number of temperature recordings within the designated range was multiplied by the sampling interval (i.e., 5 or 15 min., depending on the microsensor type). In phase 2, wear time was obtained from the adherence graphs produced by the microsensors’ software. Wear time computed from each sensor’s readouts was subtracted from the corresponding participant’s logged time to obtain the difference in minutes. The results were recorded as mean absolute response difference (MARD) and median absolute deviation. 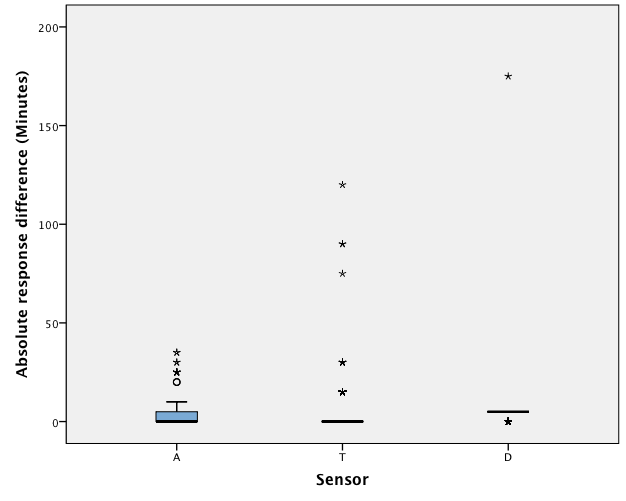 Univariate ANOVA was conducted for each trial in both phases to determine whether there were statistical differences between microsensor types. Post hoc Scheffé multiple mean comparisons were used to determine where the differences occurred. The statistical analyses were conducted using IBM SPSS Statistics 21. The level of significance, α, was set at 0.05. No technical problems occurred with sensors A and T; therefore, all measurements were included in the statistical analysis for all 3 phase 1 trials. For sensor D, 3 of the 16 sensors were faulty; 1 had a faulty internal calendar and 2 failed prematurely. In the long duration of wear trial, a large number of deviations were recorded for multiple sensor. As on days 7 and 18. As it is unlikely that all sensors malfunctioned on those days, the deviations must have been the result of assignable error (such as the water bath malfunctioning); therefore, the data for those 2 days were excluded from the analysis. For sensor A, MARD in trial 1 was 1.67 min. (SD 1.41, median absolute deviation 0.00 min. ); corresponding results for sensor T were MARD 3.53 min. (SD 9.80, median absolute deviation 0.00 min); and for sensor D, MARD 4.48 min. (SD 8.46, median absolute deviation 5.00 mins, the largest among the 3 sensors) (Table 2). Univariate ANOVA of the results showed a significant difference between the 3 sensors (F = 23.71, df = 2, 1870, p < 0.0001) (Table 3). A Scheffé multiple mean comparison revealed that A < T = D (Fig. 2). Table 2: Absolute response difference (min.) for AIR AID SLEEP (A), TheraMon (T), and DentiTrac (D) microsensors tested in vitro and in vivo. Note: n = number of observations made by microsensors in trial; CI = confidence interval; SD = standard deviation; SEM = standard error of the mean; PVC = polyvinylchloride. Table 3: Comparison of accuracy of AIR AID SLEEP (A), TheraMon (T) and DentiTrac (D) microsensors in vitro and in vivo. Figure 2: Boxplot of the response differences of AIR AID SLEEP (A), TheraMon (T) and DentiTrac (D) microsensors in trial 1. In the short duration of wear trial, a large deviation for multiple sensor As occurred on days 1, 2 and 7. These data points were excluded, as the deviations must have been the result of assignable error. In this trial, for sensor A, MARD was 1.41 min. (SD 3.60, median absolute deviation 0.00 min. ); for sensor T, MARD was 1.68 min. (SD 7.64, median absolute deviation 0.00 min. ); and for sensor D, MARD was 14.07 min. (SD 10.20, median absolute deviation 10.00 min., the largest value). Univariate ANOVA of the results showed a significant difference between the 3 sensors (F = 529.02, df = 2, 1839, p < 0.0001). A Scheffé multiple mean comparison revealed that A = T < D (Fig. 3). (p = 0.07) or sensor D (p = 0.45) as a result of material type: acrylic, PVC or thermoactive acrylic. Phase 2 participants had a mean age of 27.9 years (SD 2.78). Two participants left the trial prematurely: 1 completed only 23 nights, as she graduated and moved out of town before the trial ended; another completed only 16 nights, as she found the appliance uncomfortable to wear at night. The remaining 12 participants completed the full trial. All 28 microsensors recorded accurate pre- and post-test times. As such, data from all participants’ microsensors were included in the analysis. In phase 2, sensor A had a MARD of 6.32 min. (SD 10.08, median absolute deviation 3.00 min. ), while sensor D had a MARD of 6.81 min. (SD 8.05, median absolute deviation 5.00 min.) (Table 2). Univariate ANOVA showed a statistical difference between microsensor types (F = 6.41, df 13, 383, p < 0.001) (Table 3). A post hoc Scheffé multiple mean comparison revealed that readings for 1 participant, who wore a continuous positive airway pressure (CPAP) device concurrently with the OA, were significantly different from those of other participants; when this person’s readings were excluded, there was no statistical difference between sensors A and D (F = 0.54, df 1, 735, p = 0.45) (Fig. 4). Table 4: Amount (%) of underestimation (−), no difference (0) or overestimation (+) of wear time recorded by AIR AID SLEEP (A), TheraMon (T) and DentiTrac (D) microsensors in vitro and in vivo 30-day trials. Highlighted cells indicate how the sensor behaved most of the time in each phase of the study. Figure 3: Boxplot of the response differences of AIR AID SLEEP (A), TheraMon (T) and DentiTrac (D) microsensors in trial 2. Figure 4: Boxplot of the response differences of AIR AID SLEEP (A), TheraMon (T) and DentiTrac (D) microsensors in phase 2. Specificity calculation was used to determine the probability that a test result would be negative when the condition was not present (i.e., out of the hot water bath). The 3 microsensors were highly specific with values of 99.17%, 99.01% and 98.3% for sensors A, T and D, respectively. The index of agreement (R)37,44 between microsensor recordings and logged times was 0.995, 0.996 and 0.976 for sensors A, T and D, respectively. All 3 microsensors were strongly reliable in terms of their recording capabilities. Response difference data for each sensor in each experimental group were analyzed to identify the frequency of negative, zero and positive deviations. This represents the amount of underestimation, no difference and overestimation of wear time that the microsensors recorded. No deviation was defined as a response difference of 0.00 min. In phase 1, sensor A had no deviation for 74.4–82.6% of the time, sensor T had no deviation for 81.0–92.3% of the time and sensor D had no deviation for 10.2–25.10% of the time (Table 4). In phase 2, both sensors performed equally well: sensor A responses fell within a 10-min. range 82.72% of the time and sensor D 81.77% of the time. To put the results into perspective, the cumulative log time in phase 2 was 156 313 min. (~2605 h or ~108 days); sensor A showed a cumulative absolute deviation of 2652 min. (~44 h or ~1.8 days) and sensor D showed a cumulative absolute deviation of 2948 min. (~49 h or ~2 days), both of which translate into an overall error of less than 2% (Table 4). This is the first study to present bench testing of 3 thermosensitive microsensors and in vivo testing with quantitative results. Previous studies using sensors A and T have not reported statistical analyses on their reliability32,33,35,36,45; we are not aware of published studies on sensor D, either in vitro or in vivo. With the increased demand for objective adherence monitors, this study increases our understanding of their accuracy, which will support their use in both clinical and research settings. We found that all 3 sensors showed a high degree of accuracy in wear time. The largest response difference was with sensor D, which had a median absolute deviation of 5.00 min. and 10.00 min. for the long- and short-duration trials, respectively. Nevertheless, all 3 sensors were highly accurate and reliable and could be used to record wear time of removable OAs fabricated from various materials. During phase 1, in vitro testing, the microsensors were placed in a water bath and their computed readouts were compared with time logged by participants. Sensor A was most accurate, followed by sensor T. Sensor D had the largest deviation and was found to overestimate wear most of the time. All 3 sensor types revealed no significant differences in their recording ability among the 3 embedding materials. The impact of material type on recording accuracy of microsensors has never been reported in the literature. Previous studies29,33 have raised concerns over microsensors that depend on optical signals, such as the Smart Retainer, because of their inability to transmit signals through coloured embedding material. In our study, we examined 3 clear materials that are commonly used to make removable OAs. These materials have similar thermal conductivities; however, their thickness might have been a factor impacting recording accuracy. Although attempts were made by the laboratory technician to keep the thickness as uniform as possible, it was not accurately standardized among all blocks. For phase 2 in vivo testing, we used volunteers from the UBC dental school in hopes that they would be honest reporters and reliable throughout the trial period, as accurate logging of wear time was essential to compare against the recordings from the microsensors. There was no significant difference between sensors A and D in terms of their recordings. The main purpose of phase 2 was to test all sensors simultaneously, in the same patient. For comfort, the maximum available space in the appliances could accommodate 2 sensors. As sensor T uses the same software as sensor A, only sensors A and D were used. Sensor A had a lower median absolute deviation (3.00 min.) than sensor D (5.00 min.). Both sensors recorded no deviations in wear time within twice the sensing interval over 80% of the time. For the participant who was wearing a CPAP device with the OA, there was a significant difference between sensor A and sensor D; sensor D tended to underestimate wear time for this participant. We hypothesize that leakage from the CPAP device may have caused intraoral temperature to fall below the threshold for the microsensors to record wear (sensor D has a higher temperature threshold than sensor A). Further investigation is warranted into whether these microsensors can accurately record OA wear time when used with CPAP therapy. Sensor D was found to have the greatest variability and highest frequency of overestimations of wear time in the in vitro trials: median absolute deviation of 5.00 min. in trials 1 and 3 and 10.00 min. in trial 2 compared with 0.00 min. mean absolute deviation for sensors A and T. However, in the in vivo phase, there was no difference in the recording ability of sensor D compared with sensor A. This discrepancy may be a result of the fact that only raw temperature data from the microsensors were used during the in vitro trials to determine wear time. This was done because sensor D’s algorithm would not allow creation of an adherence graph under these conditions; this is because, in determining wear, sensor D takes into account head movement, which is not seen in a static water bath. In the in vivo phase, the data examined for both microsensor types were taken from graphs created by the software rather than raw data in an effort to mimic a true clinical setting. The discrepancy in findings from sensor D between phases 1 and 2 may be a result of the fact that only temperature was used as a determinant for wear time in the in vitro trials, which is not a true representation of how these microsensors work. Based on cumulative time that the sensors deviated from the sensing interval, sensors A and D each had an overall error of less than 2%. Of the cumulative logged time of 108 days, the deviation was only 2 days. Thus, the overall error is very small and not clinically significant as the recommended use of removable appliances is typically daily or nightly over approximately 12 months or longer, depending on the treatment. Patients treated for obstructive sleep apnea (OSA) with CPAP therapy are generally described as being adherent if they wear their appliances for 4 h/night.9-11,36 Still, the longer the patient uses the treatment the greater the improvements in symptoms and cardiovascular disease.46,47 As OSA is a chronic disease, and OA and CPAP treatments are not curative, patients are required to use such devices indefinitely with expected high adherence rates. As such, an overall error of less than 2% would not have an impact on a patient’s treatment outcome. As a quality control trial to assess false positives, the microsensors were left out of the water baths for 30 days. No effort was made to ensure that the room temperature was kept below 31.5°C. Although the probability of the microsensors reporting false positives was very low and all 3 microsensors were found to be highly specific, there was a possibility that the sensors could record if ambient temperature was high. Outside temperature was noted to affect microsensor readings when sensors A and T recorded wear times when they were left in a car on a hot summer day. For this part of the trial, we had looked at the raw temperature data without the accelerometer (instrument for measuring movement) files, which would likely have shown that the appliances were at a warmer temperature outside of the mouth. Clinicians may want to consider asking patients to store their oral appliances in cold water in a container when not in use. This will limit the number of false positives, which may occur if the appliance is left by a window or in a hot, steamy bathroom and accelerometer data are not available. In addition, it is important to note that 3 of 25 (12%) sensor D microsensors were faulty: 1 with an improper calendar and 2 whose batteries died prematurely. No type A or T microsensors had to be excluded for technical reasons. Vanderveken et al.36 reported unspecified technical difficulties with 1 in 51 (1.96%) sensor Ts over a 3-month trial. Schott et al.34 reported no technical difficulties in 100 sensor Ts over a 15-month trial. When this study began, sensor D was still undergoing beta testing with its manufacturer. This may explain the larger number of sensor Ds that failed. As all 3 microsensors must be completely embedded in acrylic, according to manufacturers’ instructions, they are difficult to remove and replace. Therefore, it is imperative that the manufacturers ensure proper testing before microsensors are shipped to guarantee that clinicians do not receive faulty microsensors that may fail prematurely. There are no studies on the possibility of reusing such sensors. There were some limitations in the current trial. The design was based on the methods of Schotts and Göz,31 who used a water bath to replicate the oral environment. However, temperature fluctuations with high peaks and dips are associated with water baths compared with the more constant temperature found in the mouth. Therefore, it is possible that, at times, the water temperature fell outside the range that the microsensors record as wear, even though they were in the water bath. A thermocouple connected to the water bath could have been used to monitor the temperature throughout the trial. In addition, the static water baths did not activate the 3-axis accelerometer that is used by sensor D to determine wear. Incorporating a vibrating plate may have may have provided more accurate recordings for sensor D in the in vitro trials. The relatively small and unequal number of microsensors tested was because we were dependent on industry donations of the microsensors. At the start of the trial, sensor D was still undergoing beta testing, and we could not obtain enough devices to match the number of sensors A and T. No previous studies could be used as a basis to determine an appropriate sample size. However, because each microsensor was tested in each trial for 30 days, the sample size is actually much larger. Only 1 previous study, which had a sample size of 1 and took place over 2 weeks, attempted to assess the accuracy of sensor T in vivo.35 There are no studies on the accuracy of sensors A or D in vivo. This pilot study can now be used as the basis for future studies with patients. Finally, if analysis of the data had shown the need for further analysis, we would have asked for more microsensors from the manufacturers; however, we found that, using our method, our sample size was sufficient to test our hypotheses. Future studies to assess the accuracy of the microsensors should test their longevity, whether sampling frequency can impact accuracy or longevity and whether batteries last as long as the manufacturers claim. It is also important to know whether microsensors remain accurate toward the end of their lifespan. Another factor of interest may be the position of the microsensor in the OA. For example, would a sensor be as accurate embedded in the palatal area as opposed to the buccal shelves, which are close to the patient’s cheeks. Further investigation is warranted into the effect of mouth breathing and concurrent use of CPAP therapy on microsensor accuracy. As a new device, these sensors claim to have the ability to report on head position and movement but these properties still require further testing, or other new capabilities in the future, such as the assessment of oxygen saturation. One must keep in mind that adding new features cannot make these sensors bulky, as patients’ comfort is important in terms of adherence. Microsensor technology has improved greatly over the last several decades. With new features, smaller size and excellent reliability, these microsensors will change the way clinicians monitor adherence. Clinicians no longer have to predict which patients will comply with removable OA therapy. Computed adherence graphs can be used to provide feedback to patients to help them improve their adherence. In addition, microsensors may be useful in helping clinicians compare the effectiveness of OA with CPAP therapy or other treatment options for OSA. The effectiveness of a treatment modality depends on both treatment efficacy, such as the amount of reduction of apneas, and treatment adherence, calculated by the number of hours during which an appliance is used divided by the number of hours slept. Effectiveness reflects the performance of a therapy in the real world without control of all treatment conditions and is particularly important in the management of chronic diseases, such as OSA. Greater adherence may counterbalance lower efficacy, resulting in similar overall effectiveness. Our results demonstrate that all 3 microsensors have a high recording accuracy and reliability and may be used in clinical settings to help clinicians monitor patient adherence to treatment with a removable OA. The results also show that the type of embedding material has no effect on the recording accuracy of the microsensors. All 3 microsensors are highly specific and over a 30-day period had an overall error of less than 2% in their recording accuracies. 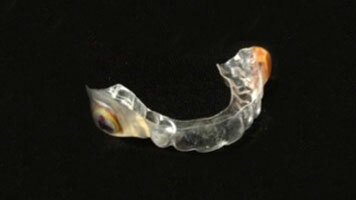 Microsensor technology is a new and exciting addition to orthodontics and dental sleep medicine. This is the first study to report detailed and critical accuracy analyses to corroborate manufacturer information that these thermosensitive microsensors are reliable and can be used to determine wear time of removable OAs. Dr. Kirshenblatt is in private practice in Toronto, ON. Dr. Chen is clinical assistant professor, faculty of dentistry, University of British Columbia, Vancouver, BC. Dr. Dieltjens is associate researcher faculty of medicine, Antwerp University, Belgium. Dr. Pliska is assistant professor, faculty of dentistry, University of British Columbia, Vancouver, BC. Dr. Almeida is associate professor, faculty of dentistry, University of British Columbia, Vancouver, BC. Acknowledgement: The authors thank Mary Wong and Dorin Ruse for assistance with the statistical analysis, Sandy Harrison and Chris Opitz at Space Maintainers Laboratory for making the appliances and blocks of material, and the manufacturers, TheraMon, AIR AID and Braebon Medical, for donating the microsensors. Gross AM, Samson G, Dlerkes M. Patient cooperation in treatment with removable appliances: a model of patient noncompliance with treatment implications. Am J Orthod. 1985;87(5):392-7. Bartsch A, Witt E, Sahm G, Schneider S. Correlates of objective patient compliance with removable appliance wear. Am J Orthod Dentofacial Orthop. 1993;104(4):378-86. Albino JE, Lawrence SD, Lopes CE, Nash LB, Tedesco LA. Cooperation of adolescents in orthodontic treatment. J Behav Med. 1991;14(1):53-70. Cole WA. Accuracy of patient reporting as an indication of headgear compliance. Am J Orthod Dentofacial Orthop. 2002;121(4):419-23. Cureton SL, Regennitter FJ, Yancey JM. Clinical versus quantitative assessment of headgear compliance. Am J Orthod Dentofacial Orthop. 1993;104(3):277-84. Northcutt M. The timing headgear. J Clin Orthod. 1974;8(6):321-4. Sahm G, Bartsch A, Witt E. Reliability of patient reports on compliance. Eur J Orthod. 1990;12(4):438-46. Pelletier-Fleury N, Rakotonanahary D, Fleury B. The age and other factors in the evaluation of compliance with nasal continuous positive airway pressure for obstructive sleep apnea syndrome. A Cox’s proportional hazard analysis. Sleep Med. 2001;2(3):225-32. Rauscher H, Formanek D, Popp W, Zwick H. Self-reported vs measured compliance with nasal CPAP for obstructive sleep apnea. Chest. 1993;103(6):1675-80. Reeves-Hoche MK, Meck R, Zwillich CW. Nasal CPAP: an objective evaluation of patient compliance. Am J Respir Crit Care Med. 1994;149(1):149-54. Sawyer AM, Gooneratne NS, Marcus CL, Ofer D, Richards KC, Weaver TE. A systematic review of CPAP adherence across age groups: clinical and empiric insights for developing CPAP adherence interventions. Sleep Med. Rev. 2011;15(6):343-56. Shapiro GK, Shapiro CM. Factors that influence CPAP adherence: an overview. Sleep Breath. 2010;14(4):323-35. Schäfer K, Ludwig B, Meyer-Gutknecht H, Schott TC. Quantifying patient adherence during active orthodontic treatment with removable appliances using micorelectronic wear-time documentation. Eur J Orthod. 2015;37(1):73-80. doi: 10.1093/ejo/cju012. Epub 2014 Jul 3. Ağar U, Doruk C, Biçakçi AA, Büküsoğlu N. The role of psycho-social factors in headgear compliance. Eur J Orthod. 2005;27(3):263-7. Gross AM, Samson G, Sanders S, Smith C. Patient noncompliance: are children consistent? Am J Orthod Dentofacial Orthop. 1988;93(6):518-9. Northcutt ME. The high-pull timing headgear. J Clin Orthod. 1976;10(12):918. Northcutt ME. Updating the timing headgear. J Clin Orthod. 1975;9(11):713-7. Mitchell JI. It’s time for the timing headgear. J Clin Orthod. 1976;10(12):919-20. Banks PA, Read MJ. An investigation into the reliability of the timing headgear. Br J Orthod. 1987;14(4):263-7. Cureton SL, Regennitter F, Orbell MG. An accurate, inexpensive headgear timer. J Clin Orthod 1991;25(12):749-54. Güray E, Orhan M. Selcuk type headgear-timer (STHT). Am J Orthod Dentofacial Orthop. 1997;111(1):87-92. Lyons EK, Ramsay DS. Preliminary tests of a new device to monitor orthodontics headgear use. Semin Orthod. 2002;8(1):29-34. Doruk C, Agar U, Babacan H. The role of the headgear timer in extraoral co-operation. Eur J Orthod. 2004;26(3):289-91. Brandão M, Pinho HS, Urias D. Clinical and quantitative assessment of headgear compliance: a pilot study. Am J Orthod Dentofacial Orthop. 2006;129(2):239-44. Bos A, Kleverlaan CJ, Hoogstraten J, Prahl-Andersen B, Kuitert R. Comparing subjective and objective measures of headgear compliance. Am J Orthod Dentofacial Orthop. 2007;132(6):801-5. Savage M. A preliminary report into the development and use of soluble controlled-release glass timing discs implanted into orthodontic appliances. Br J Orthod. 1982;9(4):190-3. Sahm G, Bartsch A, Witt E. Micro-electronic monitoring of functional appliance wear. Eur J Orthod. 1990;12(3):297-301. Ackerman MB, McRae MS, Longley WH. Microsensor technology to help monitor removable appliance wear. Am J Orthod Dentofacial Orthop. 2009;135(4):549-51. Ackerman MB, Thornton B. Posttreatment compliance with removable maxillary retention in a teenage population: a short-term randomized clinical trial. Orthodontics (Chic). 2011;12(1):22-7. Schott TC, Göz G. Applicative characteristics of new microelectronic sensors Smart Retainer® and TheraMon® for measuring wear time. J Orofac Orthop. 2010;71(5):339-47. Schott TC, Göz G. Wearing times of orthodontic devices as measured by the TheraMon® microsensor. J Orofac Orthop. 2011;72(2):103-10. Schott TC, Ludwig B, Glasl BA, Lisson JA. A microsensor for monitoring removable-appliance wear. J Clin Orthod. 2011;45(9):518-20; quiz 516. Schott TC, Schlipf C, Glasl B, Schwarzer CL, Weber J, Ludwig B. Quantification of patient compliance with Hawley retainers and removable functional appliances during the retention phase. Am J Orthod Dentofacial Orthop. 2013;144(4):533-40. Pauls A, Neinkemper M, Panayotidis A, Wilmes B, Drescher D. Effect of wear time recording on patient’s compliance. Angle Orthod. 2013;83(6):1002-8. Vanderveken OM, Dieltjens M, Wouters K, De Backer WA, Van de Heyning PH, Braem MJ. Objective measurement of compliance during oral appliance therapy for sleep-disordered breathing. Thorax. 2013;68(1):91-6. Lowe AA, Sjöholm TT, Ryan CF, Fleetham JA, Ferguson KA, Remmers JE. Treatment, airway and compliance effects of a titratable oral appliance. Sleep. 2000;23(Suppl 4):S172-8. Tjin SC, Tan YK, Yow M, Lam YZ, Hao J. Recording compliance of dental splint use in obstructive sleep apnoea patients by force and temperature modelling. Med Biol Eng Comput. 2001;39(2):182-4. Inoko Y, Yoshimura K, Kato C, Morita O, Kohno M. Efficacy and safety of temperature data loggers in measuring compliance with the use of oral appliances. Sleep Biol Rhythms. 2009;7(3):188-92. Smith YK, Verrett RG. Evaluation of a novel device for measuring patient compliance with oral appliances in the treatment of obstructive sleep apnea. J Prosthodont. 2014;23(1):31-8. Schott TC, Ludwig B. Microelectronic wear-time documentation of removable orthodontic devices detects heterogeneous wear behavior and individualizes treatment planning. Am J Orthod Dentofacial Orthop. 2014;146(2):155-60. Dieltjens M, Vanderveken OM, Van de Heyning PH, Braem MJ. Current opinions and clinical practice in the titration of oral appliances in the treatment of sleep-disordered breathing. Sleep Med Rev. 2012;16(2):177-85. Dieltjens M, Braem MJ, Vroegop AVMT, Wouters K, Verbraecken JA, De Backer WA, et al. Objectively measured vs self-reported compliance during oral appliance therapy for sleep-disordered breathing. Chest. 2013 Nov;144(5):1495-1502. Dunn G, Everitt BS. Clinical biostatistics: an introduction to evidence-based medicine. London, UK: Hodder Arnold; 1995. Abrams E, Bogen DK, Kuna ST. Monitoring adherence to oral mandibular advancement device treatment. Poster at the American Academy of Dental Sleep Medicine Conference, Boston, 2012. Darien, Ill.: American Academy of Dental Sleep Medicine. Weaver TE, Maislin G, Dinges DF, Bloxham T, George CF, Greenberg H, et al. Relationship between hours of CPAP use and achieving normal levels of sleepiness and daily functioning. Sleep. 2007;30(6):711-9. Martínez-Garcia MA, Capote F, Campos-Rodríguez F, Lloberes P, Díaz de Atauri MJ, Somoza M, et al. Effect of CPAP on blood pressure in patients with obstructive sleep apnea and resistant hypertension: the HIPARCO randomized clinical trial. JAMA. 2013;310(22):2407-15.